The great kiva Casa Rinconada is a circular structure, half-sunk into the earth on a hill. Kivas are ceremonial places in Pueblo culture, as well as symbols of the cosmos. Aligned with the cardinal directions, the line connecting the north and south doors to Casa Rinconada is within one third of a degree of true north. A compelling but contested alignment exists within Casa Rinconada. At sunrise on the summer solstice, a beam of light from a northeastern opening in the kiva precisely illuminates a niche in the far wall. The niche in question is one of many, however, it is only one of several that are uniquely placed. Several facts complicate the possibility that this alignment was intended and observed by the ancient Chacoan builders. The kiva was partially reconstructed in 1933, and its exact original plan is unknown. A room exterior to the crucial opening may or may not have existed, and may or may not have blocked the shaft of light. There is also some evidence of support beams (now missing) and other structures in the room that may have blocked the light. 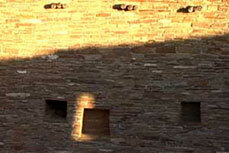 Watch as the square of light moves across the wall and niches at Rinconada. If you ask interpreter G. B. Cornucopia, the historical accuracy of the alignment may be less important than its symbolic value, especially for those who flock to the site on the summer solstice. "Casa Rinconada has become a place where people come to see an alignment. In our culture, we haven’t been taught to relate to the natural rhythm of what the sun and the earth are doing throughout the year. So here’s a place where you can come and see that—not a representation of a solstice, but the actual solstice, as mediated by a building. It’s a wonderful experience."